How can an "Empath" and a "Rock" be in a good relationship? How can an “Empath” and a “Rock” be in a good relationship? I think empaths and rocks make wonderful partners. They balance each other and help each other grow. The Rock can learn to express his passion and emotions more clearly from you, while you can learn grounding techniques from your partner the Rock. Have your boyfriend read the section on Empaths and Rock in Emotional Freedom, then discuss positive changes you both can make. I love having a partner who’s a rock. Rocks are emotionally strong for themselves and others, as well as being practical. When you’re reeling from emotions, rocks won’t lose their cool. You can sob, complain, rant. They don’t pull away or judge. But rocks are no empaths; there’s a solid border between themselves and the world. They genuinely care about your delight and pain (you can curl up in a rock’s arms anytime) but don’t bear the brunt of these feelings. Though they prefer life to be on an even keel, they won’t shirk difficulties. They’re like big bears who are solid on the earth. 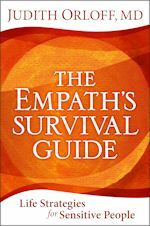 I also recommend that you and your boyfriend read my book, The Empath’s Survival Guide for more relationship strategies.